Retablos and Altar Screens start with a flat board. 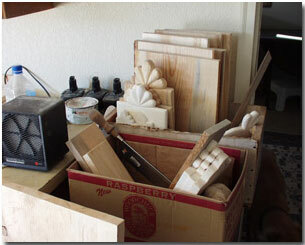 Next it is hand plained and adzed like the boards of old.I use the traditional local woods, pine and aspen. I cut the board into the shape I want and then I begin carving. It's wonderful when I am able to find a large board that is one solid piece like the one shown in the photo (approximate width is 30") for altar screens. 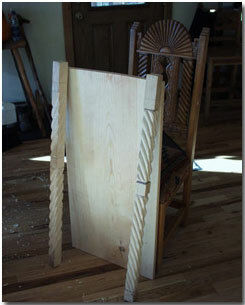 I also carve the beams, Bultos and all architectual parts for my Altar Screens. These pieces are assembled into the Altar. Pines of the San Luis Valley consist of pinion, juniper, lodgepole, ponderosa, fir, cedar and spruce. These trees were the vigas of the roofs of the homesteads, as well as the barns and corrals for the livestock. The wood was used for almost every thing needed in the settlement from homes to furniture and tools firewood and fencing.